The information contained o­n this site is not intended for distribution to, or use by, any person or entity in any jurisdiction or country where such distribution would subject Fifteen:22 Financial Partners, Nations Financial Group, Inc. (NFGI), or any affiliates, to any registration requirement within such jurisdiction or country. The information obtained o­n this site is intended for informational purposes o­nly and does not constitute a solicitation or offer to initiate a transaction in any securities product or investment advisory service. Further, nothing o­n this site should be construed as rendering legal or tax advice. Advice can only be rendered after a person has had personal contacts, completed the Fifteen:22 Financial Partners planning processes, and upon the execution of all appropriate account forms. Fifteen:22 Financial Partners will not effect or attempt to effect transactions in securities, or the rendering of personalized investment advice for compensation over the Internet. At certain places on this fifteen:22 Financial Partners Internet site, live ‘links’ to other Internet addresses can be accessed. Such external Internet addresses contain information created, published, maintained, or otherwise posted by institutions or organizations independent of Fifteen:22 Financial Partners and Nations Financial Group, Inc. Fifteen:22 Financial Partners and Nations Financial Group, Inc do not endorse, approve, certify, or control these external Internet addresses and does not guarantee or assume responsibility for the accuracy, completeness, efficacy, timeliness, or correct sequencing of information located at such addresses. Use of any information obtained from such addresses is voluntary, and reliance on it should only be undertaken after an independent review of its accuracy, completeness, efficacy, and timeliness. Reference therein to any specific commercial product, process, or service by trade name, trademark, service mark, manufacturer, or otherwise does not constitute or imply endorsement, recommendation, or favoring by Fifteen:22 Financial Partners or Nations Financial Group, Inc.
You may download or print out a hard copy of individual pages and/or sections of the Fifteen:22 Financial Partners website, and files made available for download, provided that you do not remove any logos or other proprietary notices. Any downloading or otherwise copying from the Fifteen:22 Financial Partners website will not transfer title to any software or material to you. You may not reproduce (in whole or in part), transmit (by electronic means or otherwise), modify, link into or use for any public or commercial purpose the Fifteen:22 Financial Partners website without the prior written permission of Fifteen:22 Financial Partners. Although this website may provide general information about the potential impact of taxes on various investment scenarios and estate planning, it should be made clear that Fifteen:22 Financial Partners, Inc and Nations Financial Group, Inc. do not render either legal or tax advice. Please consult a legal or tax professional for any specific advice. All articles, links or additional items are provided for informational purposes only and were not created by Fifteen:22 Financial Partners or Nations Financial Group, Inc. Before implementing any strategy discussed herein, you should consult with your own financial, tax, and/or legal advisors to determine its applicability in light of your own situation. Neither Fifteen:22 Financial Partners, Nations Financial Group, Inc nor their representatives or agents are permitted to give legal or tax advice. Any discussion of taxes is for general informational purposes only. Such discussion does not purport to be complete or to cover every situation. You should seek advice based on your particular circumstances from an independent tax advisor. Certain portions of Fifteen:22 Financial Partners web site (i.e. newsletters, articles, commentaries, etc.) may contain a discussion of, and/or provide access to Fifteen:22 Financial Partners' (and those of other investment and non-investment professionals) positions and/or recommendations as of a specific prior date. Due to various factors, including changing market conditions, such discussion may no longer be reflective of current position(s) and/or recommendation(s). Moreover, no client or prospective client should assume that any such discussion serves as the receipt of, or a substitute for, personalized advice from Fifteen:22 Financial Partners, or from any other investment professional. 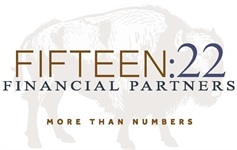 Fifteen:22 Financial Partners is neither an attorney nor an accountant, and no portion of the web site content should be interpreted as legal, accounting or tax advice. To the extent that any client or prospective client utilizes any economic calculator or similar device contained within or linked to Fifteen:22 Financial Partners’s web site, the client and/or prospective client acknowledges and understands that the information resulting from the use of any such calculator/device, is not, and should not be construed, in any manner whatsoever, as the receipt of, or a substitute for, personalized individual advice from Fifteen:22 Financial Partners or from any other investment professional. While Fifteen:22 Financial Partners strives to provide uninterrupted access to its websites, it is possible for arbitrary circumstances to prevent certain applications from being accessible. All users agree to hold Fifteen:22 Financial Partners, Nations Financial Group, Inc., and any affiliates thereto, harmless against any claim of liability surrounding accessibility of this website, any application contained herein, or any application accessible through a link provided herein.